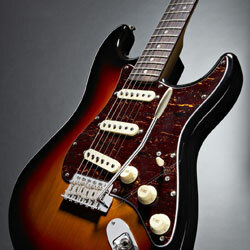 ActiveMusician.com is winding down their Classic Vibe Strat Giveaway this Friday. How does one enter? Glad you asked. Simply give a like to ActiveMusician’s Facebook page and you’re entered. Right now, this is at ~1500 likes, so that’s your chances. Not bad for a guitar with a street value of $350. Guitar will ship from our warehouse in NJ same or next biz day — depending on how long it takes to hear back from the winner (my guess is that it won’t take long).